Ensure your knowledge base is easy to navigate by breaking it up into categories and subcategories and organizing your articles. In the upper right, click Organize categories. Here, you'll see your existing categories and subcategories, as well as options to Create category and Create subcategory. By default, categories are ordered alphabetically. To change the order of your categories, click a category in the left sidebar and drag and drop it to its new position. To rename or delete a category, hover over the category and click Delete or Rename. All articles and subcategories must be removed from a category before it can be deleted. To organize a category's subcategories, click the category in the left sidebar. Any subcategories and articles within the category will appear on the right. By default, subcategories and articles are ordered alphabetically. 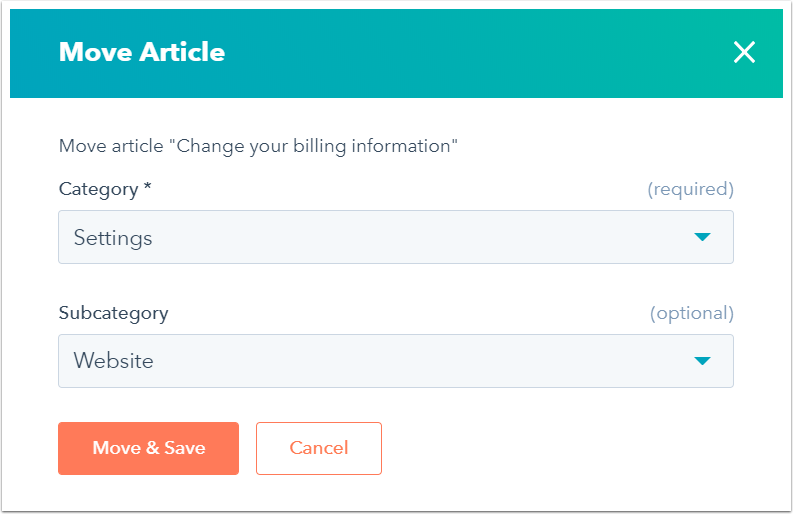 To change the order of your subcategories or articles, click a subcategory or article and drag and drop it to its new position. To move an article into a subcategory or change its existing category or subcategory, hover over the article and click Move. In the dialog box, click the Category dropdown menu and select a category. To further move the article into a subcategory, click the Subcategory dropdown menu and select a subcategory. Click Move & Save or Move & Publish. Please note: when you move an article into a different category and/or subcategory, the article URL will not be modified. Any changes to the article URL must be made in the article editor.